Follow Up Boss / FUB CRM users will be very happy as we have just launched a full API integration. This extends FUB functionality with CallAction call capture, call recording, call transcription, video text messages, intelligent text autoresponders, text drip campaigns and team lead call routing and broadcast capabilities. Any and all activity on CallAction automatically syncs' directly into your FollowUp Boss CRM. If you have a real estate team, then we can push calls and leads into the individual team members FollowUp Boss CRM account. Every inbound lead call, text, email via CallAction, automatically synced into FUB. Every outbound text or call logged. Call recording transcriptions are synced. Full lead intelligence from CallAction inputted into your FUB notes. Tags from your CallAction campaign: CallAction tracking number, campaign name, origin (call, text, email), CallAction user name... all passed as FUB tags, allowing for email automation to be assigned to fire off "lead flow" & "action plans"
Notes saved in CallAction are synced over. ... all future updates will also be pushed into FUB. Ready to implement? It will take you about 2 mins to implement if you follow these steps. 💡 Important Note: if you previously were using our FollowUP Boss integration via email parse. Please be sure to turn off all of those settings to avoid creating duplicate contacts. Please notify us to schedule a call to review all your API settings using the chat function below. Lastly, review the best practices below. Copy your FollowUp Boss API key. If you have a team, you will need to contact FUB support to obtain each agents FollowUp Boss API key. We also integrate via email parse with FollowUp Boss. If you are the only user, turn on "Collect All"
If you have a FollowUp Boss Team account. Each team member must Login to their own individual CallAction accounts and follow the steps above to integrate individual FollowUp Boss CRM. This should be in all of your accounts but if it is not, please let me know and we will get it resolved. Here's also the link to FollowUp Boss support page. 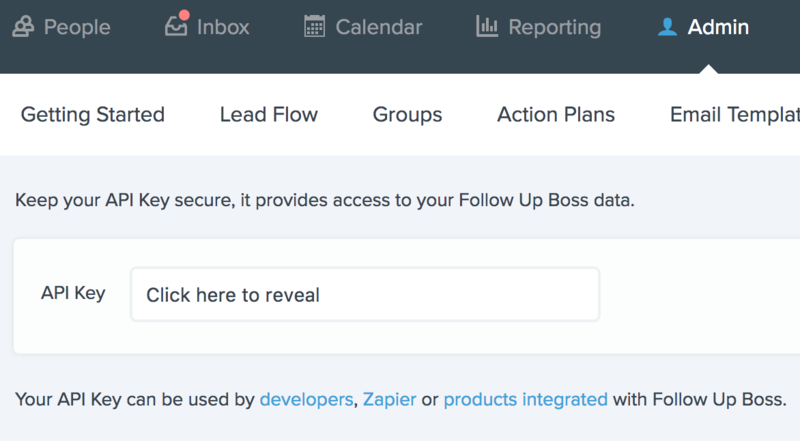 In order to avoid duplicate data from being created in your FollowUp Boss CRM via API connection, we recommend the following settings be adjusted on your other lead sources. Train Team Members Before Activating FUB API - Make sure every team member has activated their CallAction account and 100% understand how to respond to text messages by following "First Call" instructions in their CallAction profiles. Turn OFF CallAction Broadcast Text Notification - On the call broadcast settings, turn off the notification or CallAction will create a lead in FUB with agent name if they respond to text. Turn OFF Zillow Text Notifications - If using our call broadcast tool, the text notifications sent to CallAction from a Zillow email integration or any other lead source may create a duplicate contact in your FUB account causing confusion. Turn OFF Zillow Text Notifications in each agent account - you must turn off the notification because Zillow will text you the contact record with the phone number and email address. CallAction will parse the data from that Zillow text notification and append as a new record. Since the notification is also coming from the same Zillow number it will create duplicate contacts with multiple emails and phone numbers. You must turn this off. Turn OFF Zillow Call Recordings - if you have call recording/transcriptions turned on in CallAction, we recommend you turn off recordings on Zillow to speed up call connection times. You'll then be able to reset a new API key. That's it! You have now integrated your FollowUp Boss CRM with CallAction.co. If you don't use FollowUp Boss CRM but use other real estate CRMS, we have integration instructions for Top Producer real estate CRM, Commissions Inc / CINC CRM and others. Not Currently Using CallAction with Your FollowUp Boss CRM? Learn first hand how this CallAction.co / FollowUpBoss.com integration can save you time, make you more money and improve your real estate lead conversion rates. We offer a free 14-day trial and demo or our services. 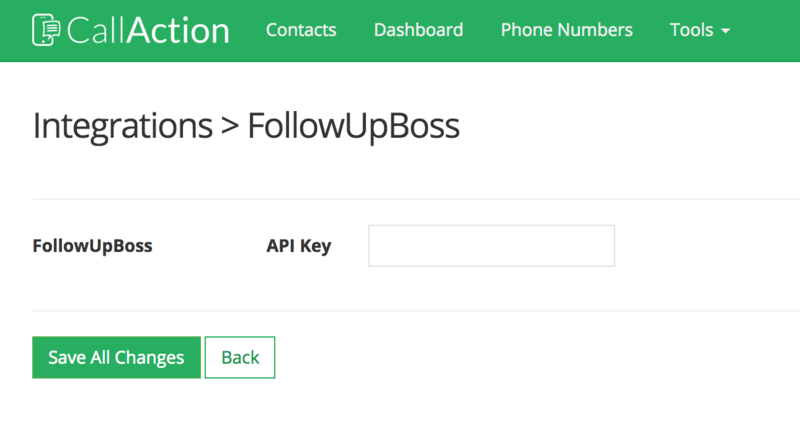 Take 10 mins to signup for CallAction now to try this FollowUp Boss integration.